**UPDATE: Starting from 6 October 2016, all JotForms are now secured with SSL without any limitations! 1. 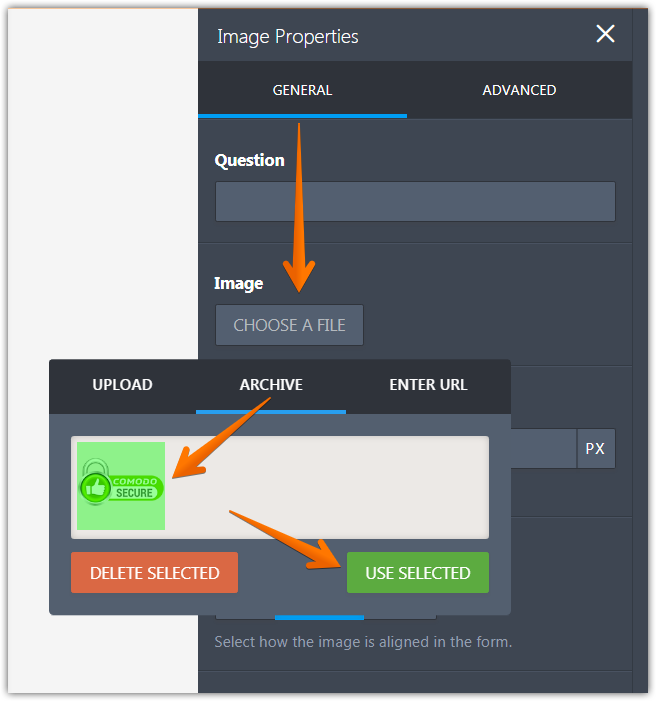 From the Form Elements menu, click on Image to access Image wizard. 2. In the Image Properties, select General tab, then select Comodo Secure Seal under Archive tab within Choose a File option. Boa tarde, vocês tem previsão de quando farão a integraçao com a pagseguro? Can I collect credit card info safely on one of these forms? Are they all SSL protected? Can I get a seal with a transparent background? My security certificate is problem.user name and password is not match on site. My Jotform does not say secure in the URL should I be worried? How do I go about making the form secure? I did not create a username and password is that the reason why? Please help. We need to start using this form ASAP! Thanks! We want to start utilizing our jotform this week. Is there something I should be doing to make sure it's secure (adding something, turning something on, etc?). How do I know or customers know that their information is secure? I'm a little worried about using this. Please help. how will customers know thats ther actually is ssl protection and that someone hasn't just added a picture of a security seal from google... is there a way to go to a page that is https:// so that customers actually know that its safe to use??? my can change the size of form do not been? Is there a way of displaying the security seal or is this feature no longer available. I am using the form on your site (not on mine) and I selected the "secure form" check off box, yet it warns clients with the following message: The security certificate presented by this website was issued for a different website's address. Can anyone help me resolve this issue? Thanking you in advance. No matter what I do it seems like the secure method does not work. Which tells everyone on my site that the page is not secure. Help? Any ideas on why the secure badge is not displaying? For some reason I cannot get the security seal to display. I've tried using Chrome, Firefox, and Opera using the form I created as well as the example from that's linked above. I have been using JotForm for over a year and have been extremely happy. Yesterday all of the form I have created on all of my clients landing pages are gone... With no warning and it says my account was suspended do to suspect of phishing. How can a company that wants to offer their clients a secure way to have a form on their facebook landing page or a web landing page use your forms and not have to worry about everything being shut down? How do I secure my forms from being edited when I send them to the form site? There is no secure place to log in and out, someone can do what they want with my url jotform page. Is data transfer to a MYSQL database secured via SSL? Form Layout: Why isn't the background image fixed? Forms not updating, cache issue again ?